Ceramic non-stick coatings have revolutionized the cookware industry. It’s now possible to make pans totally nonstick without the host of laboratory-created chemicals involved in Teflon. This means no PTFE or PFOA. More importantly, however, modern ceramic coatings have some pretty remarkable advantages in the kitchen. 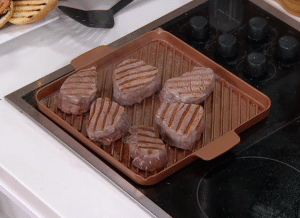 They’re more thermally transparent than Teflon, meaning they actually transfer more heat to your food. They’re also fairly adept when it comes to creating fond and are substantially more resistant to scratches and flaking than PTFE-based non-sticks. Gotham Steel is a celebrated manufacturer of ceramic non-stick pans. Gotham Steel pans are made from aluminum and have a “special” non-stick coating that’s made with titanium. In these reviews, we’ll try to establish how these pans hold up against the rest of the cookware market in order to decide whether or not they’re worth your hard-earned money. Check this one if you want to perform all of the basics of grilling on a regular burner on your stove. If you want a cheap non-stick square pan you can use in the oven, this is a great choice. Great if you want an affordable pan that does a pretty good job of heating up and distributing that heat. If you want a smaller cookware set, this 10-piece non-stick set here is the best choice. If you’re a fan of the low cost and high convenience that Gotham Steel offers, feel free to buy the whole set! There’s something to be said for grilling. By applying direct, dry heat (often at high levels) to food, you’re able to get interesting results that you can’t achieve otherwise. Think about steak, for example. A grilled steak has a certain charm that’s difficult to replicate on a skillet. That’s where grill pans come in. These transformational tools enable you to perform all of the basics of grilling on a regular burner on your stove. They’re usually big and square with little ridges on the bottom that help form “grill marks” that look like the ones you’d get on an outdoor barbecue. Gotham Steel’s 10.5″ non-stick grill pan is one such tool. It’s a non-stick 10.5″ square pan with straight sides. The interior is coated with a special ceramic coating that’s both oven and dishwasher safe. This means that not only is this pan easy to clean, you can take your food straight from the oven to the stove (or vice versa) without worrying about melting your pan. So how good is the non-stick? It’s quite acceptable, at least at first. See, the thing about nearly every non-stick on the market today is that it comes with an expiration date. When you first get a non-stick pot or pan, everything will slide off without any worries whatsoever. At some point in the future, however, you’ll notice that food will stick to your pan. With most high-quality non-stick coatings, you can get between two and five years of use out of your non-stick before it gets too sticky to be used. Gotham Steel seems to frequently come out with “new” versions of their products. This means that it’s hard to track down an accurate user report from someone who’s had the latest Gotham Steel pot or pan for more than a couple years. That said, their cookware is pretty cheap, so even if your pot or pan only stays non-stick for a year or so, you’re not out a lot of money. You can just buy another set! Now, there is one large downside to this pan, at least as far as grilling is concerned. If you really want to sear a steak, you’ll want to get your pan up to about 600 F. This isn’t the best idea on any cookware with any sort of a non-stick coating. 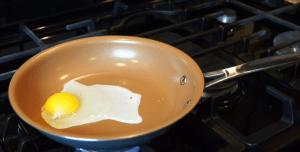 It’s “safe,” in that your ceramic non-stick won’t release any toxic gases or explode or anything, but it will damage the performance of your pan and make the non-stick less effective. In other words, if you want to cook on a high-temperature setting frequently, this pan is not the best choice for you. Honestly, this isn’t a problem in most kitchens. I get by just fine with leaving my burners on medium and lower. As long as you think you can stick to this limitation most of the time, you’ll have no problem grilling vegetables, meat, and fish in this Gotham Steel Grill pan. Personally, this is one of my favorite offerings from Gotham Steel. This 9.5″ square pan has rounded corners and straight sides. It’s got the normal Gotham ceramic non-stick and is oven safe to 500 F.
So why is it my favorite? That last part is really helpful, especially given that this pan is square. It means that you can use it to bake cornbread or brownies or fudge as well as cook on the stove. You’ll have to be careful when you cut your culinary creations (so that you don’t scratch the ceramic), but you’ll really enjoy how easy it is to slide your brownies off of the non-stick surface. It’s a pan, too, of course. 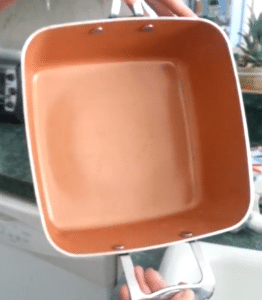 The square sides and straight walls of this pan don’t diminish from its performance when it comes to cooking eggs, pancakes, or other stove-top dishes. Like other Gotham products, the ceramic non-stick will perform very well at first, but you’ll have to replace the pan within a few years of your purchase. Don’t pick this up and expect to use it for generations. The low cost of this pan makes it an excellent choice despite this. While you could ostensibly get a stainless steel pan that would last for decades, quality stainless pans cost many times more than this inexpensive square pan. This means you can afford to replace it several times and still save money. If you want a cheap non-stick square pan you can use in the oven, this Gotham Steel square pan is a great choice. You’ll love the dishwasher safety and the high-temperature tolerance it has in the oven. To be clear: when Gotham Steel says “copper,” they mean something completely different than when All-Clad or Tramontina say “copper.” Gotham Steel’s “copper” pans (and the Red Copper Pan, and a few other brands) have very little copper content at all. Instead, there’s just a little bit of the metal used in the non-stick coating. Does this change how the pan operates? In fact, the best ceramic non-stick pans on the market use no copper at all (or at least the manufacturers don’t advertise the presence of copper or titanium or any other metals in the ceramic). Copper is generally used to help improve thermal conduction in pans at the expense of weight and heat. Gotham Steel’s pans are light and cheap, meaning that no sizeable amount of copper is used in their construction, but they also don’t have any problems conducting heat. This is because they’re made from aluminum, which conducts heat very well in addition to being light and inexpensive. Now, none of this should reflect poorly on this Gotham Steel pan. I’m just suggesting that labeling this as a “copper” pan is somewhat misleading and less useful than labeling ice cream as “gluten-free.” It might be technically true, but it doesn’t really tell us anything special about the product. Let’s talk about the frying pan itself. This pan is 9.5″ and made from aluminum with a colored exterior and a non-stick ceramic interior. It’s got a stainless steel handle that helps contribute to both oven and dishwasher safety. The ceramic coat itself is made with titanium and is quite comparable to other non-stick coatings that are advertised as containing copper. As far as performance goes, this pan does a pretty good job of heating up and distributing that heat. There are some odd manufacturer instructions you’ll have to follow when it comes to cooking regarding seasoning and the use of oil, but they’re not too bad. As long as you follow them, you’ll have no problems performing most stovetop cooking tasks with ease. Cleanup is pretty standard: all you need to do is wipe off the pan with a damp sponge in most cases. Again, the non-stick on this pan will not last forever. You can certainly find longer-lived ceramic non-sticks on the market. Also again, this pan is quite cheap. You can easily fit two or more of these things into the purchase price of a more expensive ceramic non-stick pan. This means that it’s a pretty acceptable purchase for most households. Do Gotham Steel Products Work With Induction? No. At the time of writing, there are no Gotham Steel products that work on induction cooktops that I can find. If you have an induction range, you’ll want to get a different brand of cookware. If you have Gotham Steel non-stick pans, don’t put them on top of an induction range and expect them to work. Yes. Gotham Steel cookware is effective. It transfers heat from your stove to your food, it resists warping to an acceptable degree, and it’s moderately non-stick within the manufacturer’s recommended use profile. It’s also fairly inexpensive. Now, based on my experience and my time researching user reports, it is very, very far from being the “best” cookware brand on the market. I personally don’t think that Gotham Steel is in my top 3 brands of cheap ceramic non-stick cookware, but that’s me. I definitely don’t think that Gotham Steel is a scam though. 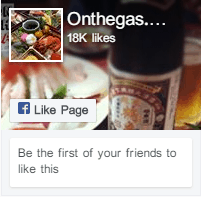 They seem to spend far more money on advertising than they do on making quality cookware. What’s In Gotham Steel’s Ceramic Titanium? We don’t know. Ceramic non-stick coatings (like the one used in Gotham Steel cookware) are a bit of a trade secret. Divulging the exact contents and proportions of the materials used to make this coating would enable other companies to use Gotham Steel’s proprietary blend of ceramic and titanium. Now, we do know some basics. Ceramic non-sticks (like the ceramic titanium used in Gotham Steel cookware) are somewhat scratch resistant, but not entirely. You can certainly leave a visible mark by scratching the surface with a normal fork. The coating is fused solidly to the aluminum base of the cookware and won’t chip or flake off, even after several years. It’s also totally devoid of PTFE and PFOA and won’t release toxic fumes at normal cooking temperatures. Finally, it tends to be oven safe to about 500F, which is pretty darn convenient. All of the ceramic non-sticks that I’ve used, including the Gotham Steel titanium-infused non-stick, slowly lose their effectiveness over time. 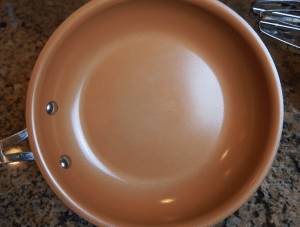 You can restore a bit of effectiveness with an abrasive cleaner once or twice, but your pan won’t last for more than a few years of regular use. Unlike Teflon pots or pans, however, the coating won’t flake off. Instead, food will gradually stick to your pan more and more. In high-end ceramic non-stick pans, this process can take several years. Gotham Steel’s pots and pans aren’t the highest quality, so you should be prepared to replace them within two years. This is an interesting question to answer for many reasons, but let me start it off by saying yes, Gotham Steel pans are totally free from most of the chemicals that people claim are harmful in cookware. Their nonstick uses no PTFE or PFOA, which are the two things you’re often told to avoid in your non-sticks. That said, Gotham Steel pans are made from aluminum. The cooking surface is coated with ceramic, which means that your food shouldn’t ever come into contact with the aluminum, but some people do believe that aluminum cookware can lead to health problems. I’m personally heavily skeptical of this claim, and pretty much every health authority around the world shares my viewpoint. There’s very little (if any) evidence to suggest that cooking with aluminum cookware is bad for you. There’s also an interesting (albeit paranoid) viewpoint that Gotham Steel’s nonstick is probably unsafe for the simple reason that we think it’s safe. If we look back on the history of pretty much everything we now know is catastrophically bad for your health, Cigarettes were once thought to improve your health. Teflon was the greatest thing ever. We put asbestos in our houses. The list goes on. While we haven’t discovered any negative effects from the particular ceramic coating that’s used in Gotham Steel cookware YET, there’s a non-zero chance that at some point in the future we’ll discover that it’s an insidious killer and that we should never have included it in our kitchens. The bottom line here is that there’s no rational reason to think that Gotham Steel cookware is unsafe. 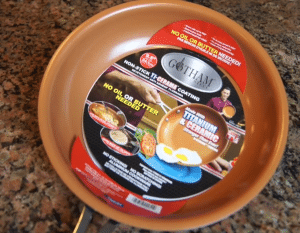 Gotham Steel is one of several companies that’s sprung up in recent years to sell low-cost ceramic non-stick pans. They’ve managed to move over a million units through a combination of TV advertising, low prices, and other clever marketing. The use a special ceramic “ti-ceramic” coating to deliver non-stick performance on their products. Despite this, the Gotham Steel pan is very comparable to the Red Copper Pan and other low-cost ceramic non-stick cookware. If you want a smaller cookware set, the 10-piece non-stick set here is the best choice. If you want the most options around, however, upgrade to the larger ultimate set for the inclusion of a frying basket, a steaming rack, a square pan, and more. Otherwise, however, the first 10 pieces of both of these sets are identical. You get the same quality of product with these larger cookware sets that you do when buying pots and pans individually. This means that the frying pans in these sets are pretty similar to the one reviewed above. They’ve got the same aluminum construction, the same “titanium infused” ceramic coating, and the same fantastic oven safety. Just like I said earlier, the ceramic coating on both of these sets has a finite lifespan. You should plan for that lifespan being a year or two. If it’s more, you can always be pleasantly surprised. Both cookware sets come with a steamer insert as well as well-fitting glass lids for the saucepans. 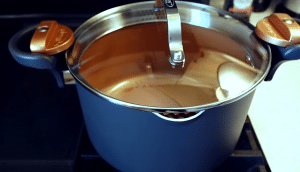 This will help you monitor your food while you simmer and boil. You’ll have no problems making pasta or rice in these non-stick pots, and you’ll definitely appreciate the easy non-stick cleanup. Truthfully, while these pots and pans are still fairly affordable, my usual argument of “cheap and disposable” stops holding water with these larger cookware sets. I’d strongly recommend that you buy a single pan or two before you try out Gotham Steel’s larger cookware lines. 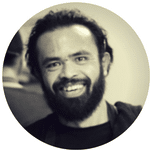 Try using the pan for a year and see what you think. If you’re a fan of the low cost, simple construction, and high convenience factor that a Gotham Steel pan offers, feel free to buy the whole set! If you’re put off by how quickly the non-stick wears out, however, or you find that the pan doesn’t quite perform as advertised, you’ll only be out a few dollars. Overall, while Gotham Steel doesn’t make the best cookware around, it makes some of the cheapest. Gotham Steel’s pans are excellent choices for the chef who wants to pick up a couple spare egg pans on an incredibly tight budget. 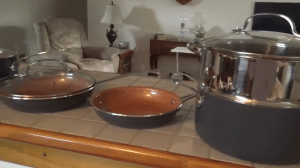 While this doesn’t necessarily translate well into their larger cookware collections, it’s still a pretty valuable quality that has sold the company over a million pans so far. Gotham Steel vs Red Copper: What’s The Best Copper Pan? T-Fal vs Farberware: Good Budget Brands? All-Clad Vs Calphalon: Is All-Clad Worth It? Best All-Clad Cookware Reviews: Is All-Clad Worth It?